Magic Leap CEO Rony Abovitz took the stage at the Code Media conference last night to talk a little bit more about the company’s upcoming AR headset, Magic Leap One. While we now know the headset will probably cost the same as a premium computer, Abovitz also co-announced with NBA Commissioner Adam Silver that Magic Leap would be collaborating with the NBA and Turner to develop an AR app for the headset. As it’s planned now, the NBA app is said to let users spawn virtual displays playing regular 2D televised games “at any size, and in any location combined with supplemental graphics that allow fans to enjoy their favorite stats, replays and commentary” says Jeff Ruediger in a blogpost, Managing Director of Magic Leap Screens. You don’t lose the social aspect of being together [when using Magic Leap One]. If you actually shut out the world completely, then I think it’s very isolating, so we’re not isolating you at all. You can watch a game, go to your kitchen, grab a beer, and you’re still watching the game. Say ‘hi’ to friends, go back and sit down, and it’s aware of what you’re doing, like if you want to get up and go do something, it can just pause everything, because it knew you got up and went somewhere. [If] you went upstairs to get something, suddenly the game reappears upstairs […] It takes everything you know about regular television and amplifies that. At launch, Ruediger says, the NBA Magic Leap One app will have a curated list of archived NBA games featuring matchups from recent seasons, and a selection of highlight clips. 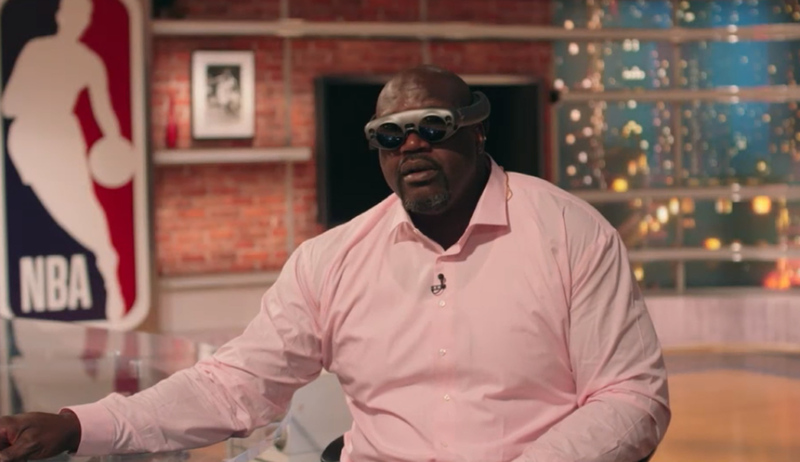 Other than the complete surprise that a Magic Leap One headset can actually fit on Shaquille O’Neal’s head, a standard “Magic Leap large” Abovitz called it, Shaq also talks a bit about some of the prototype tech he saw using the headset. The NBA app is also said to integrate volumetric video of Shaq, bringing the 7’1″ (2.16 m) Goliath into your living room.